You all are going to be jealous you don't live in Wisconsin so you can go to Bay Beach in Green Bay Wisconsin. This is an amusement park where it costs $0 to get into the park and the rides are .25 cents to .50 cents and the food is affordable too! :) We went this week and we had a great time! There are a ton of rides for little kids so Selah had an amazing time. 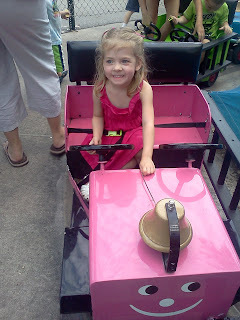 She was so happy to get the pink "lady bug." 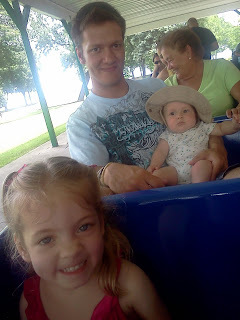 Train Ride around the park! We were just there a week ago. It was soooo hot. And it was packed, but it was a beautiful day on the weekend so it was understandable. My new baby didn't enjoy the 90 degrees and humidity, but the little man had a blast. I didn't get a chance to go on the Zippin Pippin. Did you?! Love Bay Beach and how low priced it is too. We'll have to go back before season's end.